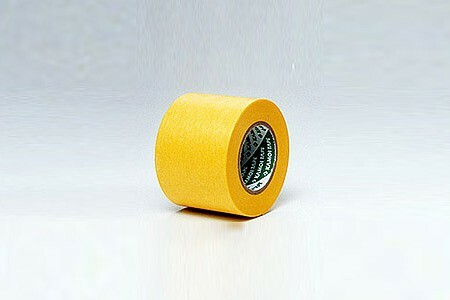 This is a Roll of 40mm Masking Tape from Tamiya. Not sure I can add anything that hasn&apos;t already been said. Test on scrap that has been painted with the paint you are wanting to mask first to see if it lifts the paint during unmasking. The only paint I have had it lift has been Dullcote over Model Master acrylic clear and Aqua Gloss. Reduce tack by sticking to t-shirt first. One of the best modeling tapes I have ever used. It is perfect for plastic parts. especially when painting in different tones. Paint leak is virtually nonexistent. "For masking a large part"
If you need to mask off a large part for painting or to protect something you have all ready painted use this size tape. Like all of the other sizes of the tape it will do a great job of holding down and the paint will not bleed under it. The only problem I have with the larger roll is that as you pull it off it wants to curl back up, so keep it pulled tight as you wort with it. I like this Tamiya masking tape. It adheres well and works well on painted items. 40mm size gives you some flexibility. I little challenging to cut and trim but still a good masking tape.